Most times, a wireless router alone is not good enough for the enterprise. The wireless router has some limitation on the coverage area, but adding more routers to the network can be quite expensive. In such cases, wireless access points like WAP610N from Linksys become significant. The primary difference between a wireless router and a wireless access point is the network intelligence. A wireless router can be installed independently and can operate accordingly. The wireless access point can only provide wireless connectivity, it relies on a network to route the traffic. Speed: WAP610N is a wireless N access point, supporting the 802.11n standard. 802.11n standard specifies the maximum attainable speed of 300Mbps and this is a theoretical speed that this router can support. However, the actual connectivity speeds would vary with the environment. For optimum performance, avoid keeping the router in some remote corner or close to other devices operating at similar frequency bands. 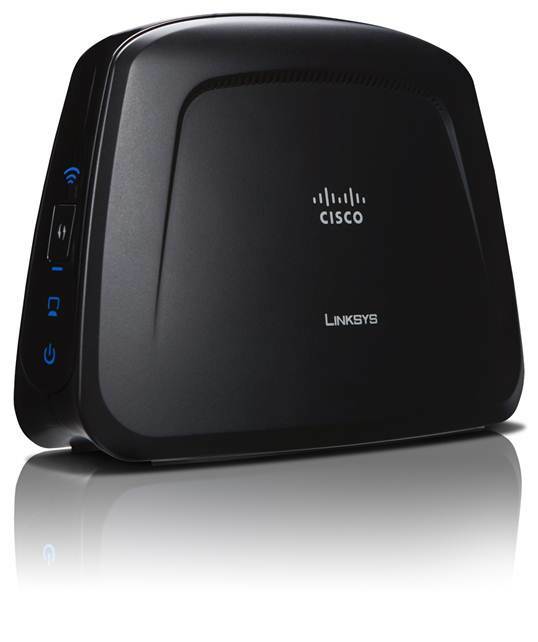 The WAP610N is backward compatible with all previous Wi-Fi standards. It supports 802.11a, 802.11b and 802.11g standards too. Most wireless N products just support wireless b/g standards as wireless ‘a’ is almost obsolete. However, networks having really old wireless devices can benefit with this router as they can also access internet through this access point. The access point also supports Wireless Multimedia (WMM) to ensure equitable bandwidth distribution based on the traffic needs. This allows supporting video and voice applications over the wireless network. Range: Being a wireless access point, the main purpose of this device is to extend the wireless reach of the existing enterprise network or introduce wireless access in the office. It has three in-built antennas that provide spatial diversity and better network coverage. While it is difficult to predict the coverage for wireless networks, going by the feedback from the users of the router, the range of WAP610N is pretty decent. Some users have also reported good reception even in remote areas in 7000 square feet areas. Some good tips to enhance the access point range are to place it in a central location in the house so that most of the house area gets covered uniformly. Secondly, in house obstructions like walls can deteriorate the signal strength significantly; hence by placing the access point and the wireless devices in a position that minimizes the hindrance can help improve the performance. Wireless Security: Being an access point, the WAP610N is does not have a lot of high end security features that typical wireless routers have. Most of the functionalities in the access point are to ensure setup a connection and ensure secured wireless network traffic flow. As this access point would be connecting to the enterprise network infrastructure, most of the security features get offloaded to the network rather than the wireless access point. However, as independent standalone system it has the basic security features that can help secure the home network. It supports Wired Equivalent Privacy (WEP), Wi-Fi Protected Access (WPA) and the more secure Wi-Fi Protected Access 2 (WPA2). It is recommended to configure the router in WPA or WPA2 mode for enhanced security. The router also has Wireless MAC filtering which typically allows the user to define the access grant permissions for a set of MAC addresses. These can be used to allow or deny devices access. Being a wireless access point, this model does not come with a default IP address that one can access to configure it. 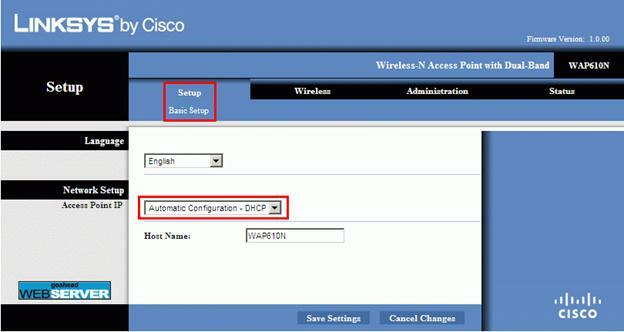 Here are the steps to connect to the setup tool for the access point. The device will automatically request for IP from the network DHCP server. Log on to the DHCP server to locate the IP address for the access point. Type in the WAP610N IP address in the computer browser and hit enter. The setup screen is displayed. Select the Manual configuration view. Under each frequency band, you can choose from mixed mode or individual standard modes. As a security feature if required, disable the SSID broadcast so only devices that know the network name can connect to it. Configure the wireless security features under the Wireless Security sub menu.